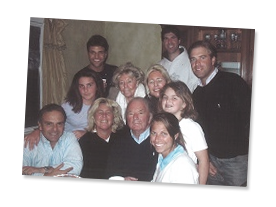 We are the Barnet Family, founders of Healthcare Products, LLC. We experienced the joy and hardship of living with our grandfather, George, who endured Alzheimer's. Through his Alzheimer's years, our family found solace by providing the proper care and attention to make his difficult moments more comfortable. In the beginning, he was able to tell us how grateful he was for our love and care to ease his suffering but in the end, we were the ones grateful to be able to provide him with the utilities to make his journey with Alzheimer's more peaceful. Living with Alzheimer's is an extraordinary hardship because of the breathtaking, progressive nature of the disease that seem inexplicable to all of us. This sense of helplessness urged us to cultivate guidance and education on Alzheimer's. 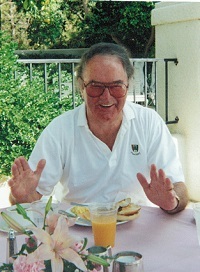 Our family is now compelled to raise the bar for Alzheimer's care throughout the world. It started as a simple fundraiser in New York City with family and friends. The goal was to raise awareness of this, as yet, incurable disease. This fundraiser has now spread to the cities of Nashville, Palm Beach, Chicago and Los Angeles. We are now taking our quest a step further by bringing to you -- The Alzheimer's Store. We hope you will utilize, as we did, the educational resources and health-related products available to make everyday life more manageable for your Loved Ones, their Caregivers and the facilities that house people with Alzheimer's and Dementia.We encourage you to visit our web site; www.alzstore.com and/or call our toll-free number at 1-800-752-3238 to find the most up-to-date products and information to comfort your Loved One as we once did for our grandfather, George. Open your eyes, we want to read you something and although you may not be able to understand, we want you to hear this. We are not quite sure when you actually left us but this is typical of what you have… you have Alzheimer's, George. You were a man of great strength and courage – a spirit that brought love and guidance to so many for so long. Everyone has their own specific way of dealing with your absence. Many choose to hang on to you, not willing to accept the circumstances. Your family has been struggling to cope with your decline in health, cling to any last ditch of hope that you would awaken from this spell. As you lay in your bed protected from the world, please know that your family is determined to keep your strength alive. Even though George could not fully understand these words at the time, they were read to him. We knew he felt our love and support. Our goal is now to empower families dealing with sufferers of Alzheimer's with the knowledge and tools they need to care for their suffering Loved Ones. We are exceedingly grateful to Ellen and Mark Warner, the co-founders of The Alzheimer's Store for allowing us to further their mission of education and equipping the Alzheimer's community. When Mark first authored, "The Complete Guide To Alzheimer's Proofing Your Home", he said, "the best gift a family can give to a sufferer of Alzheimer's is profound, abiding love and the finest care."